Ohnologs is the database for the genes retained from Whole Genome Duplication in 6 vertebrate genomes. An Ohnolog is a gene duplicate originating from whole genome duplication (WGD). 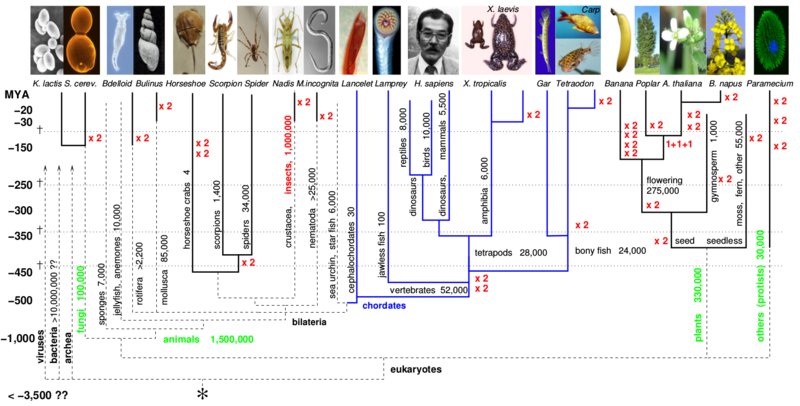 The name ohnolog has been coined after Susumu Ohno (1928-2000), who first proposed the two rounds of WGDs in the genome of vertebrate ancestor. Here you can browse/download and explore Ohnolog pairs and families in six vertebrate genomes computed with pre-defined or user-defined confidence levels (q-scores). The ohnolog pairs and families have been constructed using a quantitative multiple-genome comparative approach, we have recently developed (Singh et al. PLoS Comput Biol 2015). Please visit our help pages and references for further details on our method to identify ohnologs. In many organisms descended from polyploid ancestors (shown in the figure below), ohnologs are associated with unique evolutionary innovations. For example, ohnologs are known to be associated with signaling pathways and developmental genes in vertebrates and most likely facilitated increased genomic, morphological and developmental complexity of vertebrates. In addition, ohnologs have been shown to present an enhanced susceptibility to deleterious mutations and are frequently associated with cancer and other genetic diseases. Therefore, these evolutionary observations also hold predictive power to identify and prioritize disease gene candidates and driver mutations in the NGS studies to sequence cancer genomes.